Leaders must be able to manage themselves, first. A few months ago, my neighbor and I began discussing emotional intelligence (EQ). We often listen to audiobooks and share them with one another. I also buy several hardback and paperback copies to read offline. This talk was a little different than usual. I began to tell him about my most recent interview at an HVAC company. I was pleasingly shocked by the process. He laughed and reminded me of another website that administers a personality test named 16Personalities.com. This service allows people to take a “simplified” version of the Myers-Briggs Type Indicator (MBTI). "The test taken by an estimated 2 million people each year, has been around since the 1940s" (Zurcher, 2014). The descriptions define “define personality traits and types” into a “four-letter naming model” (Our Framework, n.d.). I have two admit that the name made me a bit apprehensive, but I decided to take the test anyway. My first result is the acronym EFNJ (I took the test three or more times), defined as an Extrovert, Feeling, Intuition, and Judgement. This trait is The Protagonist. There are sixteen unique character traits in four roles, which are Analysts, Diplomats, Sentinels, and Explorers. The authors also describe personality as, “One of many factors that guide our behavior, however. Our actions are also influenced by our environment, our experiences, and our individual goals.” The “trait-based model simply studies the degree to which people exhibit certain traits” (Our Framework, n.d.). Measured in five personality types. My results were pretty accurate. As I said earlier, I took the test three times, and I fell in between two of the Personality Aspects, which group the acronyms for each trait. These five types are Mind, Energy, Nature, Tactics, and Identity. Within the Aspects are the five groups, “seen as a two-sided continuum” that show “which categories [people] fall under, and how strong [a person’s] preferences are" (Our Framework, n.d.). What does this all mean? I can only speak for myself and my experience, so let me first say I recommend that everyone take this test, at least once. It is a great way to gain more insight while understanding how to improve their lifestyle and wellbeing. As for my traits, both are similar sides of myself. I am The Protagonist, and I am also The Campaigner. However, the result of my second and third test changed slightly. I would assume that I answered a couple of questions differently, consequently switching one of my aspects to the other side. At first, the thought that my personality may have changed bothered me. Then I look at the numbers, which meant I had to learn a little bit more about the ten sides of the Aspects. Each type is on a sliding scale with two different aspects on either side. Furthermore, depending on each respondent's answers, the metrics will fall within one of two Personality Aspects, or it can also result in a Neutral position on the scale. 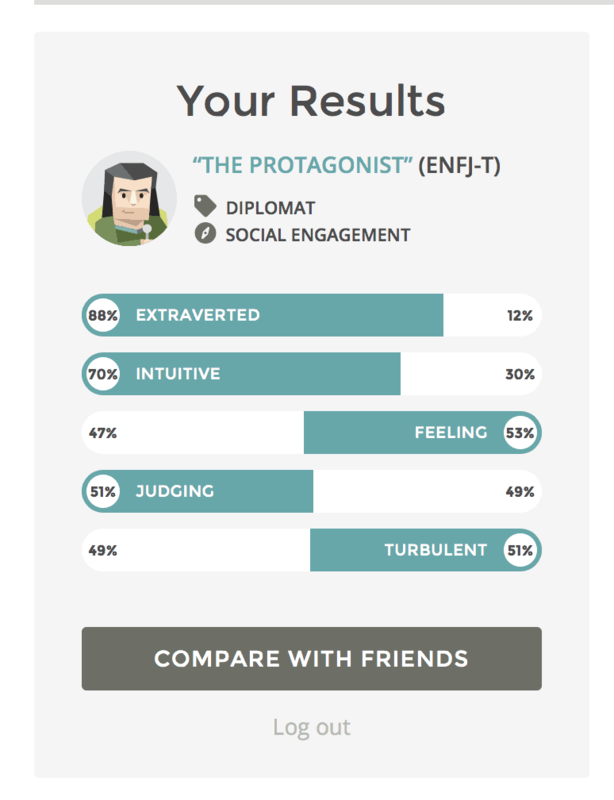 My first test results were ENFJ-T, which scored 88 percent (E) Extrovert, 70 percent (N) Intuitive, 53 percent (F) Feelings, 51 percent (J) Judging, and 51 percent (T) Turbulent (See Figure 1). The first four aspects reminded me that I had taken a Myers-Briggs sometime long ago. 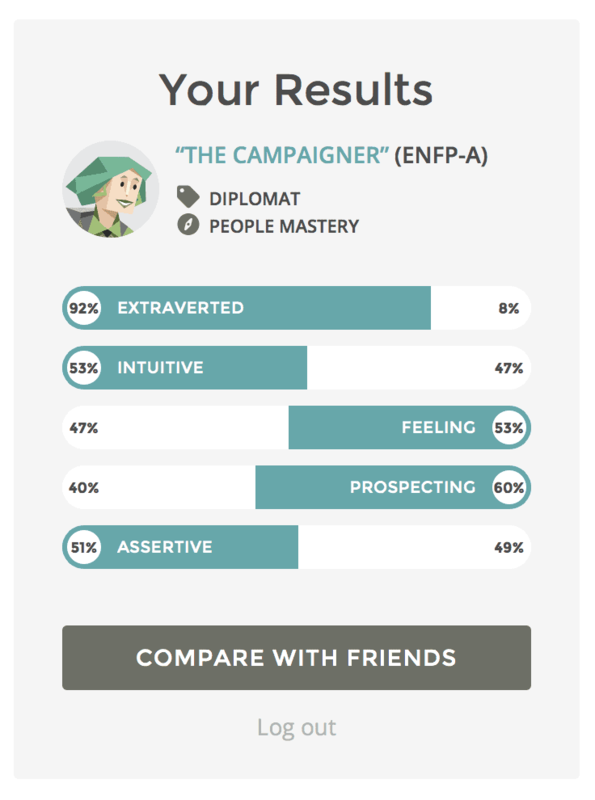 I remember the tester telling me I was an ENFJ, but he never really explained it all to me. Then again that was also before the 1995 dot-com boom. 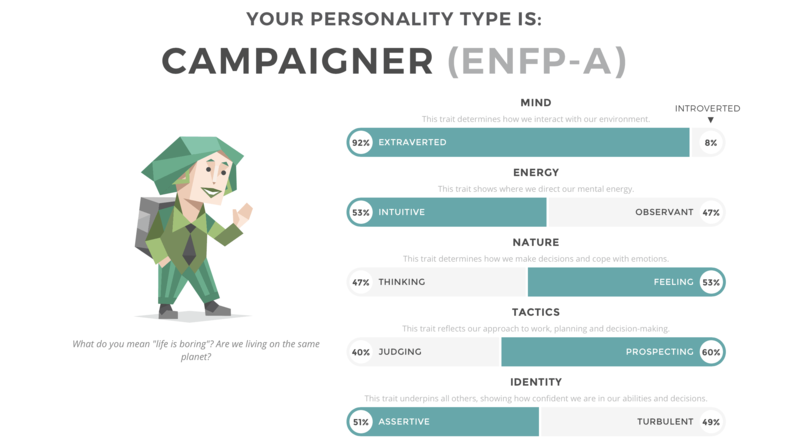 I have always been a positive person, and I identified with the explanations on the 16 Personalities website. Then in February, I started going to California State University Northridge (CSUN), majoring in Cinema and Television (CTVA): Electronic Media Management. Big words right? My Tactics started to change. By February 2018, I stopped judging and began prospecting (See Figures 1 and 2). All of my results were slightly different except I regularly started to promote positivity, emotional intelligence, self-motivation, and educational growth. 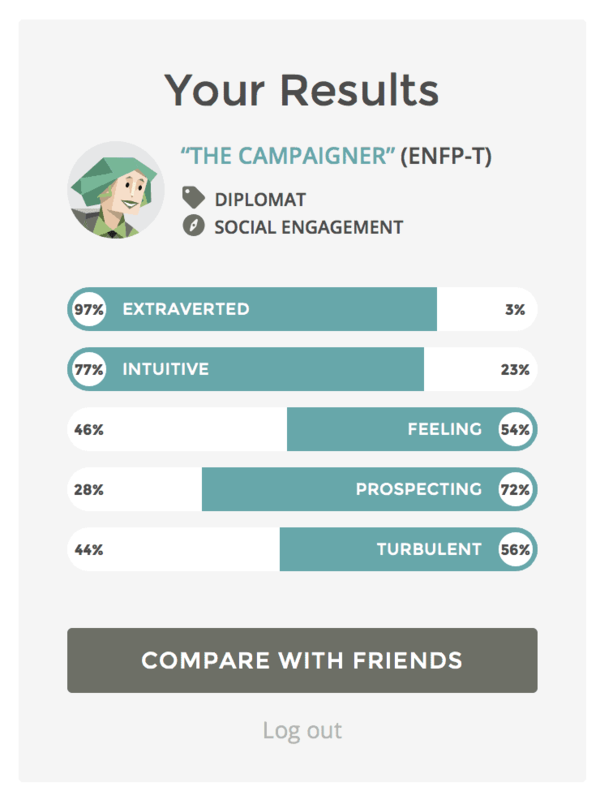 The second time I took the same test at 16Personalities.com, my aspects scored 97 percent (E) Extroverted, 77 percent (N) Intuitive, 54 percent (F) Feeling, 72 percent (P) Prospecting, and 56 percent (T) Turbulent (See Figure 2). I became the Campaigner in just a few months. I gradually became excited about utilizing my strengths and understand my weaknesses. Find it Difficult to Focus. Figure 3: StregthsQuest Strengths Finder 2.0 results. One of the messages I received from our training is that it is better to focus on your strengths and remember that each one has a "shadow" side (CliftonStrengths, n.d.). The focus of this test is to determine how we naturally use our strengths and our talents. I recently found a copy of the book by Tom Rath called, "StregthsFinder 2.0." In the back of the book, there is a free code to the StregthsQuest test at Gallup. It is also the same book sold on their website. I am often ahead of my time, but I will talk more about that later. "There are 34 talents, and we each use all of them" (Loomis, n.d.). The initial test focuses on the respondent's Top 5 talents, and we will discuss mine while comparing them to my personality traits. My Top 5 Talents are WOO, Communication, Positivity, Consistency, and Futuristic (See Figure 3). In the end, my Strengths and my Personality Traits seem to match. As a Campaigner, it would be natural for me to rely on my ability to Win Others Over (WOO), Communicate and to maintain a Positive attitude. My independence and high emotions would depend on all three to maintain my emotional intelligence. Probably why I have been able to make it through the challenges I have faced in my life. My employment and financial issues seem to be from a lack of Consistency, which is due to Poor Practical Skills, inability to Focus and how I tend to Overthink Things. Like this blog post. Then The Future takes over and my mind races. Like a centaur frolicking through Middle Earth, I am off to the woodline. My ideas for the future are almost overwhelming to many that I meet, and I have been known to discuss concepts ten years ahead of my time. Maybe I should have been born ten years later. My Futuristic Strength works well with my Curiosity and how Observant I am. Even if I don't see it, My Intuitiveness (N) and Feeling (F) will often sense the vibrations, body language, or a small shift in the social climate. Yet, as I said, in the beginning, I am both the Protagonist and the Campaigner because in my independence I prospect less and judge more. However, when I am amongst the community, I am motivated to make a change and help others grow. Campaigning inspires me to build a legacy through service, and being a protagonist reminds me that to lead I must serve. Loomis, T. (n.d.). An Overview of the StrengthsFinder Movement. (2013, August 21).